Photosynthesis is the process in which solar energy is used to fix atmospheric carbon dioxide (CO2) to chemical energy in phototrophs. Oxygenic photosynthesis is the principle producer of oxygen (O2) and organic matter that sustains life on earth. In reality, only a fraction of the solar energy that reaches the earth’s surface is actually fixed. This is because, of the average solar spectrum that reaches the earth’s surface, only 48.7% falls within the photosynthetically active band of 400-740 nm and oxygenic photosynthesis is highly inefficient. The maximum conversion efficiency of solar energy to biomass in plants is estimated to be 4.6% for C3 photosynthesis and 6% for C4 photosynthesis at 30 °C and 380 ppm atmospheric CO2 (Zhu et al., 2008). In comparison, solar photovoltaic panels convert light to electrical energy at an efficiency of 6-20% (Gul et al., 2016). Three kinds of photosynthesis, C3, C4 and Crassulacean acid metabolism (CAM), are identified in plants, based on their natural habitat, first molecule produced by the fixation of CO2 and photorespiration rate. Approximately 85% of all known plants, including crops like rice (Oryza sativa), wheat (Triticum aestivum) and soybean (Glycine max), have C3 photosynthesis, which is less efficient than C4 photosynthesis that occurs in vascular plants (~3%), like sugarcane (Saccharum officinarum), crabgrass (Digitaria sanguinalis) and corn (Zea mays). With the advances in genetic engineering, it is now possible to engineer plants for improved photosynthetic efficiency, which could in turn boost crop yield, agricultural productivity and significantly contribute to re-capturing atmospheric CO2 (Foyer et al., 2017). The ongoing multi-partner Photosynthesis 2.0 Programme was initiated to exploit the natural variation in photosynthetic efficiencies of plants and to engineer robust crop plants of the future that can withstand negative effects of global climate change, extreme weather and soil deterioration, while efficiently utilising resources, like water and minerals (https://www.wur.nl/upload_mm/2/4/5/0a26c527-34e4-4c95-8e58-4f343abdbce9_WUR_Brochure_Photosynthesis2018_vdef.pdf). The well-known ribulose-1,5-bisphosphate (RuBP) carboxylase-oxygenase (RuBisCO) enzyme catalyses the carboxylation reaction of RuBP (CO2 fixation) in photosynthesis. The RuBisCO-catalysed reaction is accelerated with increasing concentrations of atmospheric CO2. However, the regeneration of RuBP (the acceptor of CO2) by the Calvin cycle enzyme sedoheptulose-1,7-biphosphatase (SBPase) is kinetically limited, which hinders photosynthetic efficiency at higher concentrations of atmospheric CO2. With increasing levels of global atmospheric CO2, attempts to improve photosynthetic efficiency in model and crop plants have been reported. The first successful photosynthetic carbon metabolism engineering was demonstrated in tobacco (Nicotiana tabacum) by overexpressing the Arabidopsis thaliana SBPase gene, which resulted in higher SBPase activity, increased photosynthetic rate, higher levels of sucrose and starch accumulation, and total biomass increment of ~30% in controlled (Lefebvre et al., 2005) and field (Rosenthal et al., 2011) conditions. 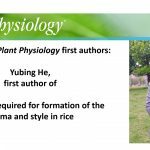 Elevating SBPase activity in the food crops tomato (Solanum lycopersicum; Ding et al., 2016) and rice (Feng et al., 2007b; Feng et al., 2007a) also resulted in similar increases in photosynthesis rate and growth under abiotic stress. In addition, transgenic wheat lines overexpressing Brachypodium distachyon SBPase have also been reported to show higher rates of CO2 assimilation, and ~40% increase in total biomass and seed weight per plant (Driever et al., 2017). 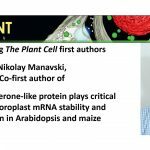 Recently, an alternative synthetic biology strategy to enhance photosynthetic efficiency by tackling the bottleneck of photorespiration that occurs in most C3 crops was reported. 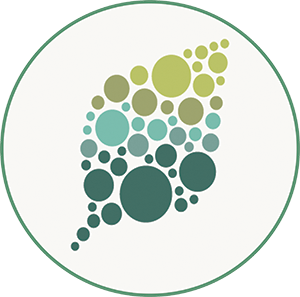 Photorespiration is the process in which RuBisCO oxygenates the substrate RuBP, which leads to costly processing of toxic by-products, such as glycolic acid, and 20-50% reduction in photosynthetic efficiency. To overcome this bottleneck, South et al. installed a synthetic glycolic acid metabolic pathway in tobacco chloroplasts by expressing pumpkin (Cucurbita maxima) malate synthase and Chlamydomonas reinhardtii glycolate dehydrogenase and inhibited glycolic acid export from the chloroplast by downregulating the expression of a native glycolate transporter. The resulting homozygous transgenic tobacco lines showed >40% increase in biomass in field trials (South et al., 2019). These limited examples of engineering photosynthesis for improved efficiency highlight the complex nature of the light reactions, which are carried out by highly conserved structural components that are organised into evolutionarily conserved multiprotein complexes. 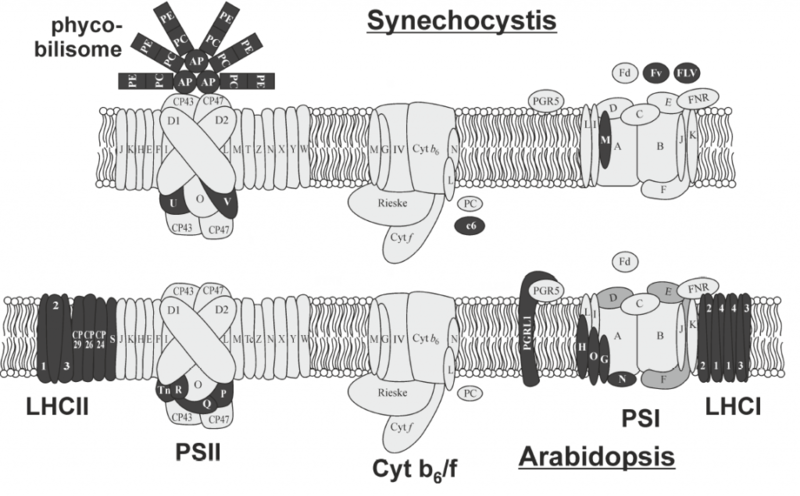 Photosynthesis in plants require the interaction of two photosystems that are excited by light of wavelengths ≤700 nm and <680 nm, referred to as PSI and PSII, respectively. The reaction centres of each photosystem contain chlorophyll molecules that differ in their light absorption maxima, because of which they are denoted as P700 (PSI) and P680 (PSII). 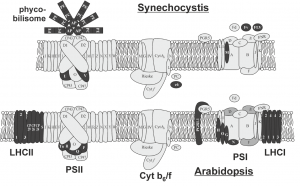 To maintain the flow of electrons, the photosystems are connected by a multiprotein complex called cytochrome b6f (Cyt b6f) and the electron carriers plastoquinone and plastocyanin transport electrons from PSII to Cyt b6f and from Cyt b6f to PSI, respectively. The reaction centre in each photosystem is associated with a light-harvesting complex that consists of different proteins, as a result of which PSII and PSI have defined functions in plants, with the former involved in the splitting of water to release O2 and the latter involved in the reduction of NADP+ to NADPH. Cyanobacteria and algae also use water as an electron donor and have two photosystems, which contrasts with purple and green photosynthetic bacteria that have only one photosystem (Blankenship, 2010). However, among the two photosystems, PSI has an inherent higher photosynthetic efficiency than PSII (Caffarri et al., 2014). In this special issue on synthetic biology, Leister (2018) sheds light on the synthetic biology strategies that have applied the light reactions of photosynthesis for not only increasing biomass and crop yield, but also for coupling evolutionarily unconnected pathways to produce high-value compounds in vivo and for the generation of hydrogen or electricity in vitro. The evolutionarily conserved photosynthetic modules in plants, algae and cyanobacteria have encouraged many groups to study the effect of swapping homologous proteins between species. However, these simple genetic engineering feats have resulted in reduced photosynthetic efficiency or a total loss of photoautotrophy, highlighting the incompatibility of such approaches, despite the high similarity between core subunit proteins of photosystems. As discussed in Leister (2018), this inability to exchange conserved modules is a prime example of how evolution has optimized individual components of multicomponent systems to adapt to their intrinsic environments for optimal interactions and thus optimum function. As a result, exchanging single proteins disturbs the evolved optimal state and causes suboptimal photoautotrophy, a phenomenon that was initially coined as the ‘frozen metabolic accident’ (Shi et al., 2005) and then generalized to the ‘frozen metabolic state’ (Gimpel et al., 2016). To prevent disturbing established networks, it is proposed that future engineering of highly integrated systems, like photosynthesis, should consider exchanging the entire complex together with its coevolved networks. In fact, this was demonstrated with the successful assembly of A. thaliana RuBisCO in Escherichia coli when chaperones were co-expressed, highlighting that the associated network and embedded interactions are crucial for complex integrity (Aigner et al., 2017). The significance of auxiliary factors in transferring synthetic photosynthetic modules was evidenced in the study of Aigner et al., because of the distant evolutionary nature of E. coli. However, this revelation adds another facet to the concept of the ‘frozen metabolic state’ and encourages consideration of cofactors, chaperones and assembly factors required for the assembly of multiprotein complexes in future engineering efforts. It is also interesting to note that the reintroduction of photosynthetic proteins lost in the evolutionary transition from cyanobacteria to chloroplasts in algae and plants, has demonstrated enhanced stress tolerance and an advantage to growth and photosynthesis in the transgenic plant, which contrasts with the unsuccessful expression of plant proteins in cyanobacteria. Leister (2018) also extensively discusses the various synthetic biology applications of exploiting the photosynthetic machinery for driving unrelated biological and non-biological processes. The light reactions have an inherent capacity to generate reducing power (NADPH), which can be coupled to reactions that have a high demand for electrons. In plants, the cytochrome P450 family of enzymes are well known for their subcellular localisation to the endoplasmic reticulum, involvement in biosynthetic pathways of high-value compounds and their demand for NADPH as a cofactor for catalysing various reactions. Several studies have relocated cytochrome P450s to the chloroplasts to harness the reducing power of the light reactions, which was successful in both in vivo and in vitro reactions. On the other hand, hybrids of PSI and cytochrome P450 or hydrogenase enzymes have been generated and demonstrated to be functional in vitro. The PSI-hydrogenase hybrids were engineered for the generation of H2, which is a sustainable and clean source of energy. However, their extensive use is inhibited by the O2 sensitivity of the hydrogenase enzymes and extensive efforts are directed towards markedly enhancing the lifetime and efficiency of these hybrids for H2 production. An alternative approach is to use hybrids of PSI with an abiotic catalyst, like platinum or earth-abundant molecular catalysts, which unfortunately are less efficient compared to the PSI-hydrogenase hybrids. Although in its infancy, PSI-based photocurrent-generating artificial systems are also being developed to generate electricity and the progress on these have been elaborated in Leister (2018). The light reactions of photosynthesis provide ample targets of opportunity for synthetic biology applications. Leister (2018) sheds light on the power of sunlight and photosynthesis in addressing food and energy sustainability challenges of the future.